Interactive books are a must for teaching concepts- particularly abstract concepts like wh- words. They're especially useful and engaging for children with limited verbal output, children with autism, visual learners, kinesthetic learners, and children with high energy! 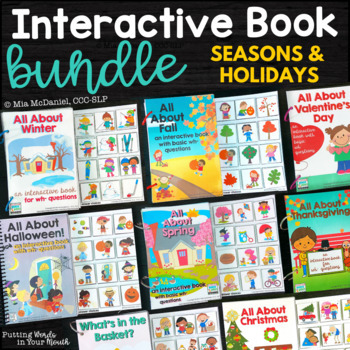 This BUNDLE has interactive books for each season (summer to be added in 2019) as well as several holidays (currently Halloween, Thanksgiving, Christmas, Valentine's Day, and Easter). Other holidays may possibly be added. Use these easy to assemble interactive books to engage your little ones while familiarizing them with the routines of the various seasons and traditions of the holidays. Teaching materials to help teach students HOW to answer each type of wh- question are included. Whether students already grasp seasons and wh-questions somewhat or not, these books will give them tons of practice! Besides questions, they contain loads of basic concepts and topics that elicit language. ** It should be noted that this book is appropriate for verbal OR nonverbal children. The books use relatable characters engaging in familiar activities. They often prompt children to point to something on the page or perform an action - a fun and truly interactive part of this book! Another page then asks students a wh- question that requires an answer. Students can tell the answer verbally OR children with more limited verbal skills can physically “give” or adhere the answer to the book by choosing the appropriate image from the 12 moveable picture choices. The goal is to get the child to pair the picture with a verbal response. If he/she does not offer a verbal response, model it for him/her. The repetitive nature of this book is likely to eventually shape verbal response. Your modeling is key! Even if the child seems to just be guessing, your repetitive modeling can still drive the concept home! BE SURE to visit each items included in the bundle so you can be fully informed about what you are purchasing. Check out my other interactive books, and I have many more interactive books in the works! An INTERACTIVE book for teaching WHAT questions & ACTIONS! An INTERACTIVE book for addressing answering WHERE questions! An INTERACTIVE book for WHO questions & actions! An INTERACTIVE book for teaching WHEN questions & ACTIONS! Interactive Books for WH- Questions BUNDLE!